The Lotter is one of the most established and highly regarded online lottery websites in the industry. Around for over ten years now, TheLotter offers access to over 51 national and international lotteries--more than any of its competitors. They are a lottery agent; which means they actually buy your ticket, scan it, and send you a copy--by far the most secure type of online lottery. They have an intuitive, easy-to-use website, a free mobile app for instant access, and a wide array of deposit and withdrawal options. All of that, coupled with plentiful options to play in syndicates or buy in bundles make TheLotter, by far, the best online lottery site currently on the market. Access to Tons of Lottery Games: One of the most unique aspects of The Lotter, which also happens to be one of its greatest advantages over playing the lottery the traditional way, is that they allow anyone to participate in a plethora of both national and international lottery games. Multiple Deposit and Withdrawal Option: To cater to their international client base, varied deposit and withdrawal options are supported by TheLotter. You can pay through bank transfer, American Express, Master Card, Diners Club, Visa, Solo, and many more. Mobile Support: TheLotter's mobile apps (Android and iOS) give you the full functionality of their website at your fingertips and on the go, which means that you can do just about everything TheLotter-related wherever you are–like playing any of the 50 lotteries, as well as checking on up-to-date results. Multi-Language: TheLotter supports 15 languages, which includes Japanese, Deutsch, French, Spanish, and more. Rates Can be Expensive: Your winnings through TheLotter are given to you commission-fee. In order for them to keep operating, however, they do tack on handling fees for every lottery ticket you purchase; which means that using this online lottery website's services will be more expensive than purchasing tickets in person. Must Claim Jackpot in Person: Like most online lotteries, if you win the jackpot prize in any international lottery, you would need to fly out to the country where that particular lottery operates. While most people would not miss the opportunity and would fly out, the fact remains that some people might not have the resources to do so. Founded in 2002, TheLotter is one of the oldest and most trusted online lottery websites in the industry today. Beyond its amazing capability to connect you to over 51 lotteries worldwide, and actually deliver time and time again, this is one of the most secure lottery websites around. Thanks to their use of one of the best data encryption technologies to date, the GeoTrust 128bit SSL security layer, your payment information is under tight lock and key. It’s also worth nothing that in their more than a decade of existence in the online lottery game, they have had no documented public scandals due to nonpayment or policy dispute issues. They are truly a tried and tested company. The moment you lay eyes on TheLotter’s website, you will probably feel a bit overwhelmed by the amount of information that is immediately available. However, don’t get scared by all the different information that the website lays out. If you decide to stay for a bit and explore, you will find that this is, to put it simply, a really user-friendly online lottery website. Their front page contains some very useful information that should immediately get you up to speed on almost everything that pertains to the numerous lotteries you can access on this site. You can get a quick glimpse of all the lotteries and their corresponding countdown timers for the next drawing, thanks to an image scroller that you can manually flip through. Below that and slightly to the right of the page lies the latest lottery results, so you can immediately see if you have won any lotteries in case you somehow missed their automatic notifications. Searching for lotteries to play, meanwhile, is also a breeze. 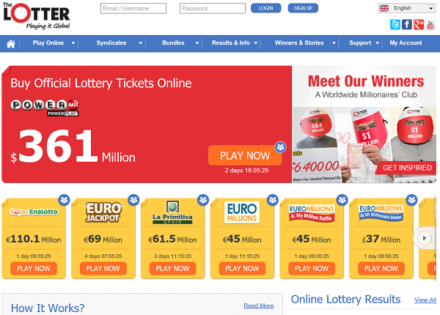 The Play Online drop-down menu at the top of the page, for starters, lists the world’s biggest lotteries along with their corresponding prizes, as well as a link to all 51 lotteries. Adjacent to this is the Syndicates menu, which works in a similar fashion. Clicking on a lottery, meanwhile, directs you to a page where you can: choose your game type, such as Standard, Syndicate or Bundle; choose your numbers manually or automatically via the Quick Pick option; and even opt in for a Multi-Draw, where you get to participate in a preset number of draws, or a Subscription, which is exactly as it sounds. If you are unfamiliar with a particular lottery’s mechanics, each individual lottery’s page includes in-depth information that details how to play it, what differentiates it from other lotteries, how to claim prizes, and more. TheLotter doesn’t seem to like resting on its laurels–they continuously update the games they have on tap, despite offering the most number of lotteries among its peers. In fact, just recently, they added two new lotteries to the mix: Jersey Cash 5 and Italy Lottomatica. These new additions join more popular lottery games such as Powerball, Mega Millions, Euromillions, SuperEnalotto, EuroJackpot, and more. As if a vast single play game selection isn’t enough, theLotter also offers more than 20 syndicates. So if you are into group play games, then you’ll definitely feel right at home here. Beyond that, they also offer a couple of millionaire raffles (one of which only opens up during the middle of the year). As mentioned previously, TheLotter offers a whole host of deposit and withdrawal methods for your convenience. Deposit options include Visa, MasterCard, Diners Club, Discover, Skrill, NETeller, WebMoney, Kash, Poli, Sofort, GiroPay, Maestro, Nordea, bank transfer, and a whole lot more. Meanwhile, winnings are immediately deposited into your account, which you can withdraw via Visa, MasterCard, Diners Club, Discover, Skrill, NETeller, and bank transfer. If you have TheLotter’s proprietary Prepaid MasterCard, you can also get instant access to your money from any ATM with a MasterCard logo. However convenient they may be, it’s important to note that remote withdrawal options can be used for secondary prizes only. For jackpot prizes won through TheLotter, you will have to claim the prize in person; which means that, if you live in the U.S. and were to win a lottery located in France, you would need to fly out there in order to claim it. Finally, TheLotter does not claim any commissions from any of your winnings; they only tack on a handling fee for every ticket you purchase in order to keep their business running. This makes purchasing tickets from TheLotter slightly more expensive than actually buying them offline. However, considering that you get access to a global network of lotteries, a slight price increase does not seem so bad at all. And, even better, should you feel dissatisfied with their service for whatever reason, they will gladly refund your first purchase in full. TheLotter’s customer support team can easily be reached thanks to a bevy of options available to customers 24 hours a day, 7 days a week, and in 15 different languages. They have toll-free lines available for several countries; including the UK, Russia, Australia, Germany, Canada, South Africa and Ukraine. You can also write them an email, or initiate a live chat session with one of their agents. Meanwhile, if you prefer to self-educate, their extensive FAQ section should definitely do the trick. It simply begs to be said again and again: TheLotter is one of the best online lottery websites in the market right now, not just because of their longevity in the business, but also because they allow you to play in over 51 lotteries worldwide, right in the comfort of your own home. More than that, their user-friendly website makes the whole process easy to digest for newcomers. Plus, with multiple deposit and withdrawal options, as well as handy mobile apps, playing the lottery has never been more convenient. So, are you feeling lucky today? Check out TheLotter now! What's the Verdict on TheLotter? Yes. I can attest to the awesome services and games provided by The Lotter. I have been having games with them for months now, and my winnings have been amazing. their easy-to-use app and easy withdrawal rock my mind always. Only Lotter and Lottery master, which is another great lottery site has these kinds of features and I must say the two sites deserve more than 5-stars anywhere and anytime. This review is indeed completely true and sincere! Keep it up, guys. Can I play online lottery as I am playing but not sure about my state & country ???? Please confirm if tommarrow jackpot in my hand so no trouble come due to this reason. If you are playing international lotteries online, you should be safe for the most part. Indian gambling laws don’t really apply to international lotteries. That said, it is still advisable to ask your local government what their stance on playing online lottery is, just to be safe. I enquired too much but getting mix views from Indian lawyer & sites towards no clear indication what fact. Can u help where I can get exact detail about play & jackpot amount point. What do you mean “play & jackpot amount point”? I believe I already answered that. It should be safe since it is not a local, land-based lottery (if you are indeed playing an international lottery). But, again, I can’t answer that with 100% certainty because I don’t live in India and the laws where you live are not immediately accessible to me. Currently, these 12 states allow lotteries: Assam, Arunachal Pradesh, Goa, Kerala, Madhya Pradesh, Manipur, Meghalaya, Maharashtra, Nagaland, Punjab, Sikkim, and West Bengal. Hope that helps!